Intellectual property rights are prohibitory rights, but not rights of use. If, for example, a patent is granted because its subject matter is new and inventive over the state of the art, this does not mean that you as the patent owner are thereby free to manufacture / market the device disclosed or claimed therein. It may be that the patent, or rather the corresponding product, includes all of the features which are claimed by a competitor’s patent, then the latter would be infringed by the advertising, market launch and sales of your product. The same principle applies to designs and trade marks. When launching a new product, in parallel to the endeavors to obtain intellectual property rights thereon, a study should be done to make sure that the product would not infringe third party rights. We would prepare an opinion on your “freedom to operate” or “right to practice”. The effort on the part of the market participants to obtain such a opinion falls under their due diligence and is of utmost importance. This is particularly so in the USA, as negligent market participants can have triple damages awarded against them. Also in Europe and Germany a freedom to operate opinion is an indispensable component of the due diligence required by a market participant. It is assumed that every market participant is aware of the IP-situations in his field of activity. He cannot argue ignorance in subsequently brought infringement actions. This “freedom to operate “ opinion should extend to all intellectual property rights, for example patents, utility models, designs and trade marks. A central aspect in the preparation of this opinion is the search for and subsequent analysis of the intellectual property rights of third parties that may be infringed by your own product. The risk of infringing third party intellectual property rights is thereby limited by finding those rights in good time before your market launch. If necessary you can than make alterations to the product or trade mark. Due to the unmanageably high number of intellectual property rights nowadays, you can never be entirely certain that all relevant third party intellectual property rights have been found during the search. The search is therefore always a compromise between the most extensive search and a search which can be done in an acceptable time and at acceptable costs. There will be in addition still unpublished intellectual property rights at the time of the search which can of course not be found. Nonetheless, the “right to practice” opinion is still of central importance. It enables you to make changes before the market launch if necessary. If despite that you still face an action for infringement you can show that you did not act negligently. 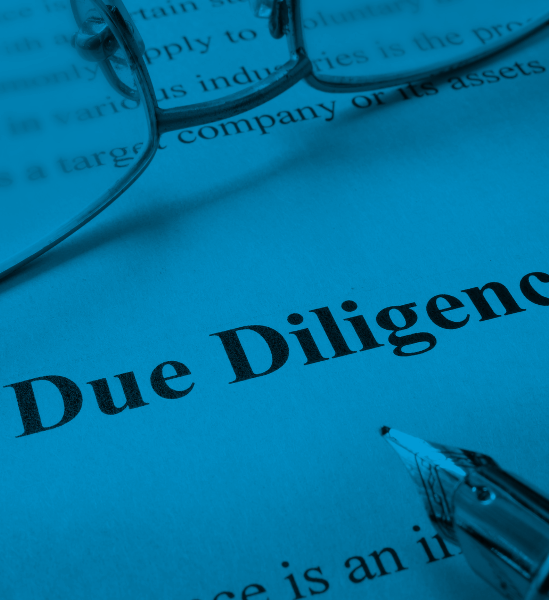 We would be happy to advice in question of due diligence, including the preparation the due diligence opinion and conducting the necessary searches.